From Barca to Bayern: Why is Pep Munich bound? Guardiola oversaw a trophy-laden four years for Barcelona. It was a surprise, but it made sense. That is how I can best describe my reaction to Pep Guardiola’s decision to sign for Bayern Munich. After months of speculation which linked him with the likes of Chelsea and Manchester City, the 42-year-old manager decided to turn his back on the bright lights of the English Premier League, opting instead, to ply his trade in the burgeoning German Bundesliga. I genuinely thought Pep was heading to Manchester City. The English champions had recently hired two of his former colleagues at Barcelona, Ferran Soriano and Txiki Beguiristain, and in my mind Guardiola was next in line. He would have had the complete backing of the owners, who would surely have given him the necessary funds to satisfy his needs both on and off the pitch. You may be wondering why I have decided to ignore the fact Manchester City already have a high profile manager in Roberto Mancini. Well, quite simply I believe he won’t be around next season. The club had another disappointing campaign in the UEFA Champions League, I’ve heard he isn’t very popular with the players, and considering he probably won’t win the Premier League, his future looks bleak. But let’s shift the spotlight back over to Guardiola and his decision to move to Germany. It is my belief he picked Bayern because he considered his long term career rather than immediate notoriety, profile or finances. Pep could and would have made more money at Manchester City or Chelsea, but he didn’t want his life to turn into a movie. He knows very well the kind of media scrutiny that managers are under in England and he wanted no part in it, at least not yet. In his mind, by opting to work at Bayern, he can coach a big team, but still live in a healthy environment. Sure there will be pressure in Munich, but it can’t compare with what he would face in England. What we can’t forget when assessing his decision is the Bundesliga is one of the best leagues in the world and it will continue to grow. Stadiums are full, clubs are financially stable, and revenue is rising. There is also plenty of talent around with the new generation of German players showing their worth with the national team. Finally, when trying to understand Guardiola, we must take into account about that he is a man who has never followed the beaten path. When he was a player, after leaving Barcelona, he could have joined any one of several big clubs but, instead, he decided to sign for Brescia. Why? Because there was less pressure, less fanfare, and also because he had a chance to play with Roberto Baggio and a young Andrea Pirlo. So if you take all factors into account, the thought process which led to Guardiola’s move to Bayern makes sense. He joins a huge club with a healthy philosophy that is built to win and win now. I totally agree with your thoughts on this, however i think the most important factor was the structure of the club itself. The best club in Germany alongside of being the most famous, one of the few clubs that won the 3 major European competitions, WORLD class training facilities (i think much better than Chelsea an Manchester city by far..), Youth House culture ; again, cant even be compared to MAN C and Chelsea and even if it could, the culture of promoting youngsters is far more developed and it is almost an intrinsic value of BM. Guardiola is a very intelligent person and quite methodical and i am sure his aim is to do something like mourinho did with Chelsea (not that linear, but it can be related). Furthermore, if BM can win trophies with jupp heynckes (my personal opinion of him is not very good as you can state on the irony of this line) imagine what they can aspire with a proper coach. Anyway keep up the good work and best regards from a PT guy living in Hungary but still follows you with admiration due to your excellent work over the years. peps choice is superb!! bayern is one of the biggest clubs in the world. abramowitsch and the sheikk from city arent guardiolas-class. he likes history and he can work with former world-class players like sammer, hoeness, rummenigge and beckenbauer in the management. and he has a very talented squad...and enough money to get some players he want...isco, goetze, munian or suarez. Pep left Barça as he was tired of Mou. Mou can make a 24/7 war on his rivals all the season. Pep will not go to the Premier, where he will likely found him again, after Real Madrid kicks him, making his life miserable. Pep will be under plenty of pressure at Bayern. However, I believe Bayern offer Pep the best path to success in the short and long term. Their playing philosophy is much closer to Barcelona than the English clubs mentioned and their roster is also much better suited to Pep's ideals. Both Chelsea and Man City would have required several seasons to fit Guardiolas style. I think Pep will work well in Bayern despite the fact that he will have much pressure and expectation to win from fans of Bayern. Although his success is predictable, what is required for him to succeed? First of all, mastering German is essential. Language is the most important tool to connect the thought of players and that of the boss. I have ever seen many players who could not play well because of the lack of understanding which comes from the difference in native language. Thus, it is better for him to learn German as soon as possible, but I heard he has already started, so it does not matter. Secondly, he must be accustomed to the style in Bundesliga from that in Barcelona. Players in Bundesliga are physically strong, which is totally different from those in Barcelona. I am looking forward to his new styles of football. Finally, although he will be under much pressure, he must not lose himself to get as many titles as he achieved in Barcelona. To try new challenge is very tough for everyone. I will enjoy watching how Pep will thrive in Germany and his adaptability toward new surroundings. he is waiting for man u managerial job...after sir ferguson leaves in 3-4 years time...mean while win the bundesliga with a good team who will win it this year without him anyway....and if he is lucky win the champions league too...PS he wouldn't want to join chelesea for the hire n fire reasons ...n man city because of the cross city rivalry when he would step into man u later...love to see bayern vs barca in champions league in the 3 seasons he will be there! I wish Pep good luck at Bayern. He's still one of the best coaches around. So we expect him to win trophies, including the champions league in Germany. running scared of Mourinho!!! nice try Pep, cuz you know Mourinho is never going to manage in Germany. What Pedro Pinto just said makes sense of course. But the difference of this is what really makes Mourinho the best couch and you can not compare him to Pep or Del Bosque becouse he (Mourinho) takes the most difficult jobs such as couching Chelsea, Inter and niw Real. In this clubs , owners want immediat results and he gives al least 50%. 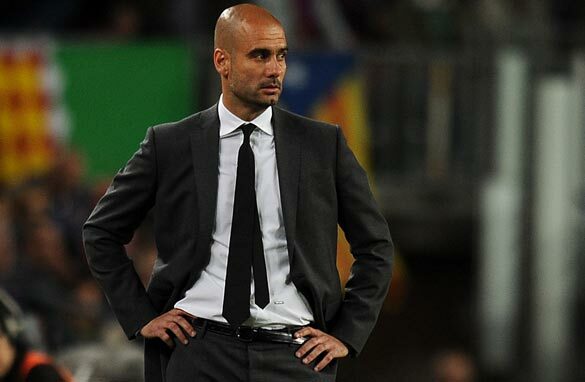 Pep of course knew that he would have the same destiny as the brasilian Scolari ou Di Mateo, etc. He took the easiest job of course where the team is already strong and leading. Bayern is a big club with a rich history. Wishing, Pep, his players and fans exciting times ahead. Good thinking, good timing. He has made a good decision by moving to a Bayern side that has a great promise with less pressure from the owners unlike what he would have faced in England. He couldn't have made a better decision. In England he will always be on the spotlight and with the kind of person I sense Guardiola is, a place like England won't be good for his career at least not for now.